Although the color combination is classic with a long history, blue and white in home decor is currently trending! This charming stack of mismatched plates would be great for a brunch or dinner party! Charlene loves mixing antiques with new items. 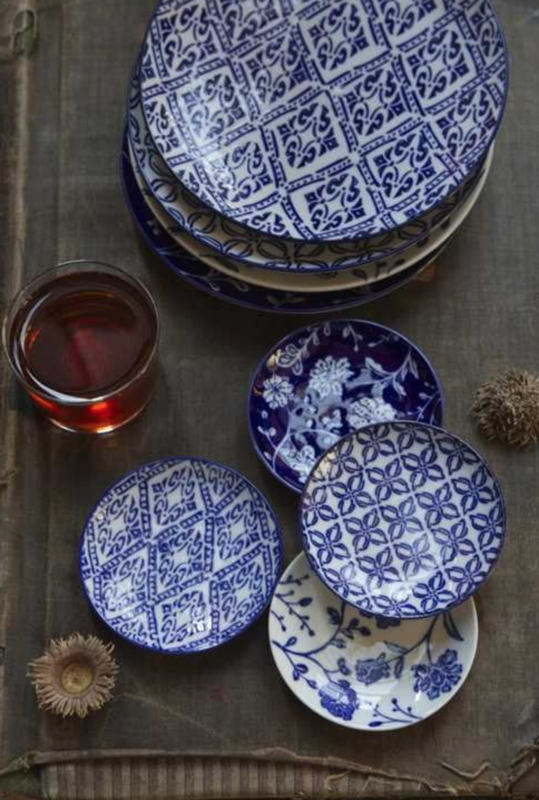 If you have a collection of antique blue and white plates, they can also be mixed with contemporary blue and white plates. The photograph below mixes old and new elements beautifully. The vintage silver ware and plate, pair wonderfully with a new cotton gingham napkin. Charlene loves collecting blue and white quilts for many uses. Besides bedding, quilts make great tablecloths. Try laying one down on your next Spring table with a ginger jar (see below) full of peonies or lilac. The pink and soft purple petals are absolutely stunning against the blue and white jar. This blue and white tier sets on a beautiful matelassé quilt- another one of Charlene's favorite collectibles! Charlene has over 25 antique matelassé quilts and has used them for tablecloths, bedspreads, shower curtains, bedskirts, and so on. Your blue and white pieces do not have to be antiques. You can buy them from Williams-Sonoma, Pottery Barn, and other retailers!